Steady but welcome rain will spread northward overnight bringing beneficial rain to the region by morning. Rain will be off and on in spots before filling in later Friday afternoon. This will continue into Saturday afternoon with temperatures generally in the upper 50's/low 60's. Showers stick around through Sunday night to close out a wet weekend. The radar shows decent rains in the Baltimore-NYC region slowly advancing north. High pressure in New England is keeping us dry at the moment. That high will weaken slightly allowing the precipitation to reach New England tomorrow morning but it will not be strong until the high moves to the north and east towards Nova Scotia Friday afternoon. Here is the current surface chart. Here is the simulated radar for Friday 8 AM. While it appears most of the rain is to our west and south some showers will be around in Southern New England. Thanks to this temperatures will max near 60. The wind will again be out of the northeast so there will be that nasty bite to the air again tomorrow. The surface forecast map for 8 PM Friday shows low pressure moving along a stalled frontal boundary with high pressure to the north. This rain continues into Saturday. Here is the 11 AM simulated radar. The culprit of all this mischief is this upper low in the Ohio Valley. This will slowly move east. As it does it will help to pull Hurricane Matthew to the north into Jamiaca, Cuba, or Haiti (or all 3). Here is the forecast track from the National Hurricane Center. This puts the storm in an interesting position in 5 days. Some models show this storm causing trouble at the end of next week. A good scenario would involve only rainfall to Southern New England. That said most storms escape out to sea in early October. The Mid Atlantic and Northeast have really only been hit 2 times in the last 65 years (1954-Hazel 2012- Sandy). But there are some anomalous weather patterns present in the Northeast and Western Atlantic so its one to watch. The drought monitor is out and Massachusetts really needs the rain. Wells are drying up in Central and Eastern Mass. This is impacting residents who depend on well water and crops as we approach the harvest. I'll be watching for you. Stay dry this weekend. A upper level 500 mb cut off low will contribute to gray skies, occasional drizzle and brisk northeast winds for Wednesday and Thursday. A steadier rain is likely overnight Thursday into Friday. Steady showers look likely all weekend. Thanks to low level moisture max temperatures will be stuck in the low 60's. Currently it is overcast with temperatures in the 50's. Expect some periods of drizzle or light showers today with temperatures struggling to hit 60 north of the MA Pike. A front is stalled offshore which is allowing for onshore flow out of the Northeast. This means the greatest chance of showers is closer to the coast but a few could work inland. Overnight lows will be around 50 thanks to cloud cover and onshore flow keeping moisture around. Lows will be in the mid 50's to near 60 along the coast. Now for Thursday the weather is nearly identical to today although a hair warmer. When I talk about a closed 500 mb low I am talking about ~18k ft in the atmosphere. It looks like this on an upper air chart. The reason the front is stalled is thanks to a stagnant atmosphere in the Atlantic. Remember the atmosphere is a fluid so it something is preventing the "waves" from moving through the fluid anomalies will occur. The cut off low is one of them. The upper low drops out of the upper level steering pattern. For example here is the jet stream at the same time at 250 mb (around flight level or ~34k ft). The steering winds are up in Canada in blue. Rain begins to develop Thursday night. By Friday AM low pressure off the Carolina coast begins to move north. At the same time the front will still be stalled offshore. High pressure will also build north of New England in Quebec. The 500 mb chart at the same time shows the big ridge in the Atlantic and the upper low in the Ohio Valley. The UL will transfer some energy to the surface low at the coast. This is similar to the evolution of a winter storm. If this high was in place during winter snow lovers would be dancing in the streets. That high will allow for moisture to lift over the frontal thanks to a clash of air masses. That will add beneficial rain to Southern New England even when the low is hundreds of miles to our south. Look where this system is able to pull moisture- the Gulf of Mexico and Caribbean. Bursts of heavy showers embedded with lighter showers is likely beginning Thursday night and continuing into Friday. Light to moderate showers continue through Sunday. The system looks like it finally kicks out next Sunday night into Monday. Here is the total rainfall through Monday 8 AM. 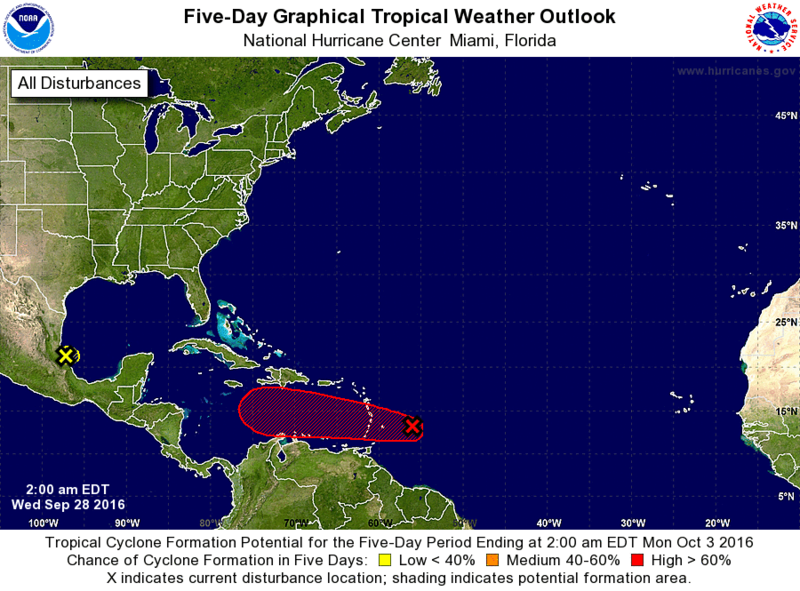 After that its time to watch this tropical disturbance in the Atlantic. It is moving into a spot favorable for a north turn in October. Most models turn it north and most make it a Hurricane but its a good 8-12 days away so just be aware something is possible at the end of next week. The National Weather Service in Taunton has posted a Frost Advisory in the areas in Blue. Overnight lows will drop into the mid 30's for interior Southern New England as dry air and clear skies allow temperatures to plummet. Temperatures rebound into the low to mid 60's tomorrow with sunny skies and light winds. High pressure is in control over New England. A cold front will move the high offshore and bring some beneficial rain tomorrow night into Tuesday AM. An upper level low will then develop in the mid levels of the atmosphere. As a result there will be rain chances every day this system is present. The low will be in hurry to move which is just what we need to help the drought in NewEngland. We need this pattern to deliver. I'll post on this again soon but enjoy the crisp air tonight. Fall begins at 1021 AM today. Temperatures will cruise into the low to mid 80's with low dew points under sunny skies. Winds will shift slightly to the south later today but they will be light. Here are the max temperatures that will likely peak around 3-4 PM. If you are headed to Gillette the tailgating weather looks outstanding. By the time kick off rolls around temperatures are right near 70. The wind will be not be a factor for the game tonight. In fact for a New England night game the weather is perfect. On Friday Canadian high pressure will drive a cold front through the region. It looks like a first batch of rain will be possible north of the MA Pike tomorrow morning before a second area of showers/thunder develops in the evening south of the Pike. Overall I am not expecting much rain at all outside of a few thunderstorms. Enjoy the game, talk to you soon. The Autumnal Equinox (first official day of fall) is this Thursday but we will have to wait until Saturday before the atmosphere recognizes the sun's return to the Southern Hemisphere. A cold front stalled along the south coast will depart later today keeping everyone region wide in the low 80's with dew points in the 60's. High pressure will be in control through Thursday before a cold front brings a chance of showers on Friday. Crisp, cooler weather is in store for this weekend. Low level moisture is lingering this AM especially in areas that saw the most rain yesterday. Fog has developed and will slow the commute in spots. Most of the actual rain is south of New England but some showers are working onshore in SE MA/Cape Cod. These showers will likely pull away by early this afternoon. The showers are present along the stalled frontal boundary partly responsible for yesterday's rain. Here is the 2 PM surface forecast and notice the showers are pretty much in the same spot now as the boundary will be later. Western MA/Connecticut River Valley is furthest from the boundary so they will be the warmest today. 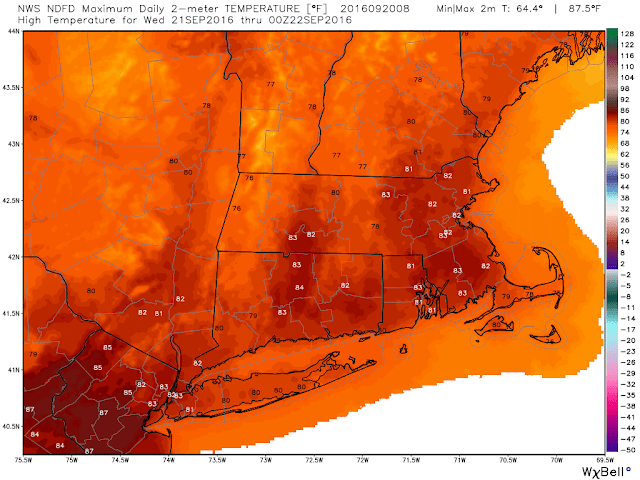 Central and Eastern SNE will also be right near 80. Now if you look at the surface forecast chart for 2 PM you will see another cold front near the US Canadian border. This is mainly just an air mass front with little moisture. Check out the dew point's for 3 PM this afternoon. Notice how Southern New England is stuck in the low 60's but Upstate New York and Pennsylvania are in the low 50's. That boundary will clear New England overnight but not before some patchy fog will develop again. Low temps will be in the low 60's in general. Wednesday temperatures again soar into the low to mid 80's. Dew points drop into the low 50's. The lower dew points will drop overnight temperatures into the low 50's Wednesday night. Temperatures again soar into the mid 80's on Thursday. The Pats game should be perfect with high pressure in control and a frontal boundary to our north. That front makes it move later Friday which is our next real precipitation chance. Its not a great one as the front won't be able to generate drought busting rains but it could produce isolated thunder that could impact high school/college athletic events Friday evening. High temperatures Saturday are looking much cooler as we struggle to get to 70. High pressure keeps Southern New England dry today but a cold front approaching from the west will bring needed rainfall overnight tomorrow through Monday. It looks like Southeast New England stays dry until tomorrow afternoon, including Foxboro for at least the 1st half. 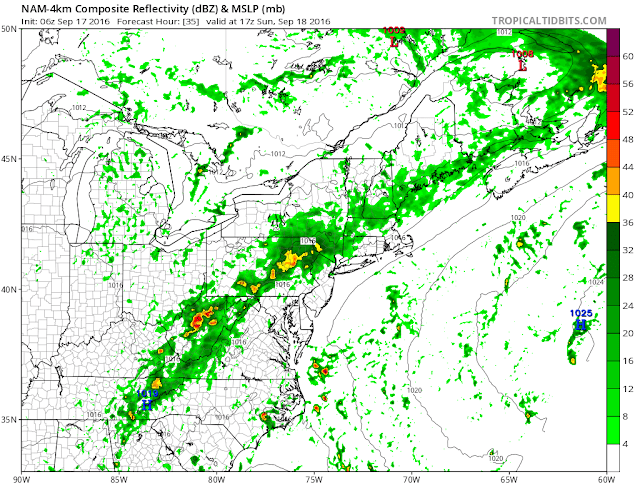 Monday appears to be wet with a chance of embedded thunderstorms as the cold front passes. 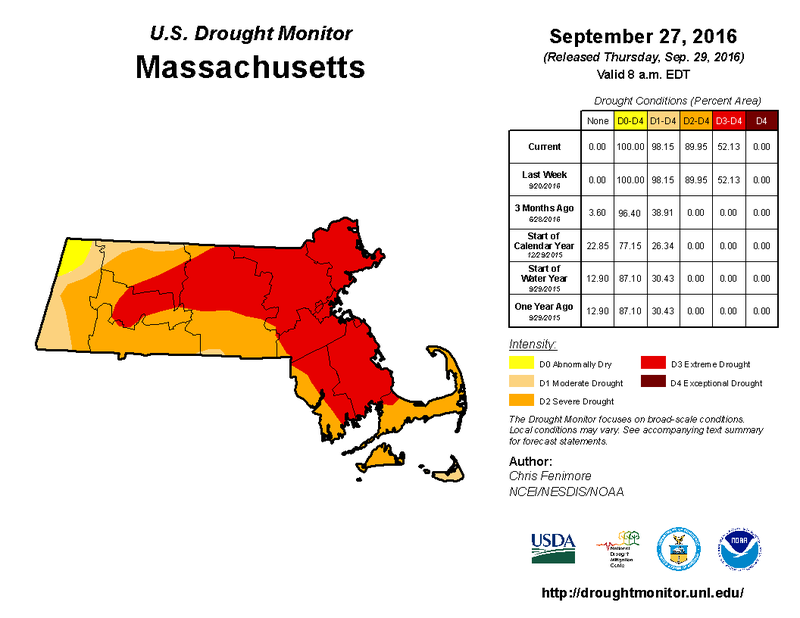 Extreme drought is increasing across MA and NH so we will take whatever we can get. Here is the AM water vapor satellite loop. Initial sun this morning will begin to give way to high clouds as the system continues to push east. As it does a few showers and thunderstorms could interrupt the Florida State-Louisville game in Kentucky this afternoon. Here's hoping for a thunder delay so I can watch the end of the game. 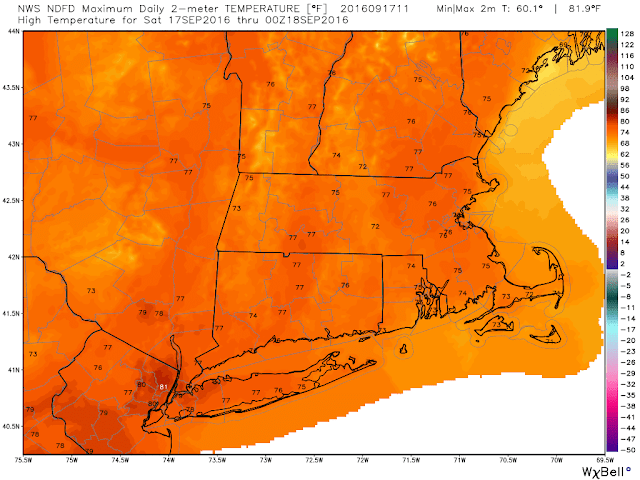 Back in SNE temperatures are firmly in the mid 70's today. High clouds will begin to filter out the direct sunshine this afternoon. As we approach the later parts of September the sun rapidly loses its strength when filtered by any type of cloud so expect it to feel chilly this afternoon at times despite a wind shift to the south. Here is the forecast surface chart at 8 PM. As we approach Sunday AM it will be raining in Western and Northern New England. The cold will be slow to approach thanks to high pressure in the Atlantic fighting off the approach best it can. 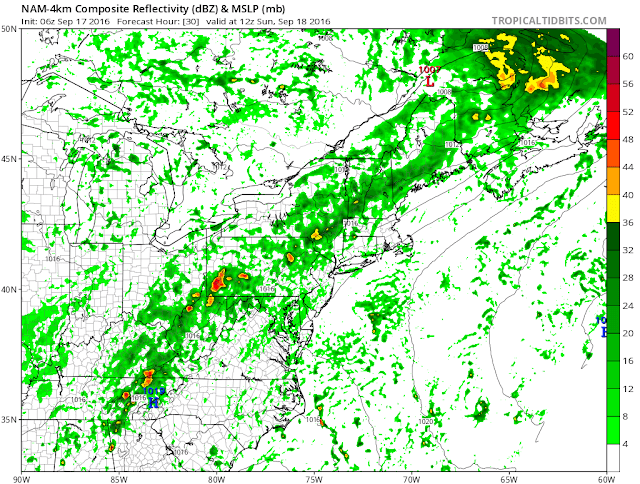 Here is the Sunday 8 AM simulated radar. At 2 PM we see rain knocking on the door of NYC, Philly, Boston and Washington. The Steelers, Panthers, Redskins, Giants, and Patriots are all home at 1 PM tomorrow so weather could be a factor in all of those games. Here is the current simulated radar for kickoff. I would like to see tomorrow mornings model runs and radar trends but as of now only Giants-Saints and Steelers-Bengals looks to be negatively impacted by weather. 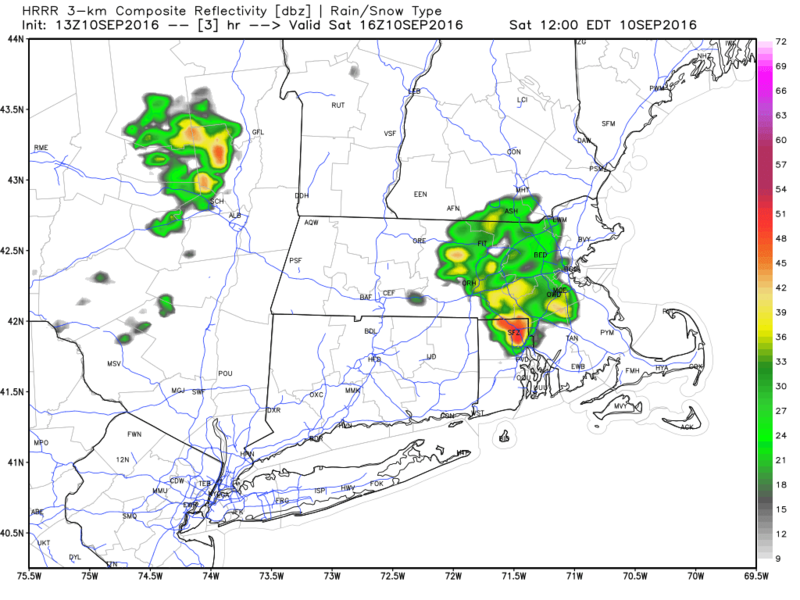 Rain will overspread SNE by Sunday evening. Here is the cold front Monday AM. The simulated radar (which is probably junk at this range but it gives the idea that heavy rain is possible/likely in our region) at the same time. Temperatures will be in the low 70's as this moisture has a slight tropical connection thanks to Tropical Depression Julia which is weak off the Carolina coast. I will update tomorrow. Get the pumpkin coffee, pie, and beers ready! I actually don't like any of those (won't say no to a Sam Octoberfest tho) but many do. A cold front will push through New England tomorrow afternoon. Behind the fropa (frontal passage) Canadian high pressure will build. Nighttime temperatures will fall into the 40's while day times highs will be right near 70 for Thursday and Friday. Before we get to that a few thunderstorms will be possible tomorrow. The past two days have been extremely pleasant. We still need rain badly but it's just not in the cards. Might as well enjoy the beautiful weather. Temperatures will not fall much overnight. Expect lows in the 60's. Humidity levels will creep into the low 60's tomorrow which isn't too bad. High temperatures tomorrow will reach into the low to mid 80's with a west wind. Here is the forecast surface map at 2 PM tomorrow. The Storm Prediction Center in Norman, OK has noted a marginal threat for severe weather tomorrow afternoon. Atmospheric conditions appear similar to Sunday AM. The biggest threat will be damaging wind gusts exasperated by the ongoing drought. Winds that normally wouldn't knock down trees could. This is a small chance but a chance none the less. 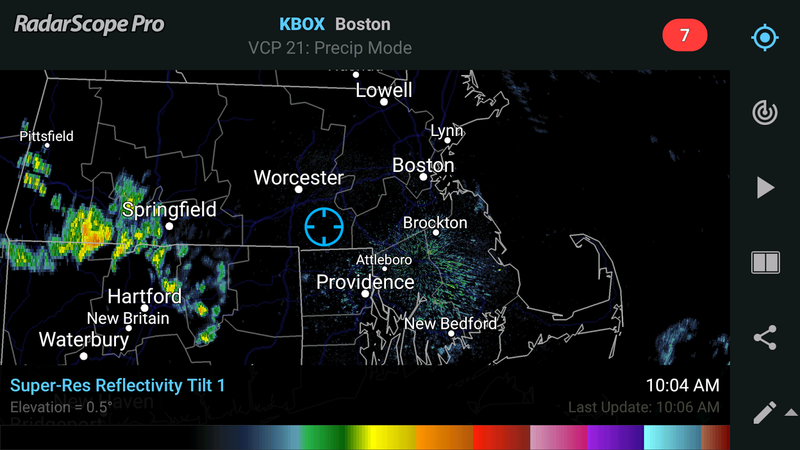 The afternoon radar does not look super impressive for Southern New England. It does seem like the best action for thunderstorms will be NE MA/S NH/S ME and then another round in SW CT. 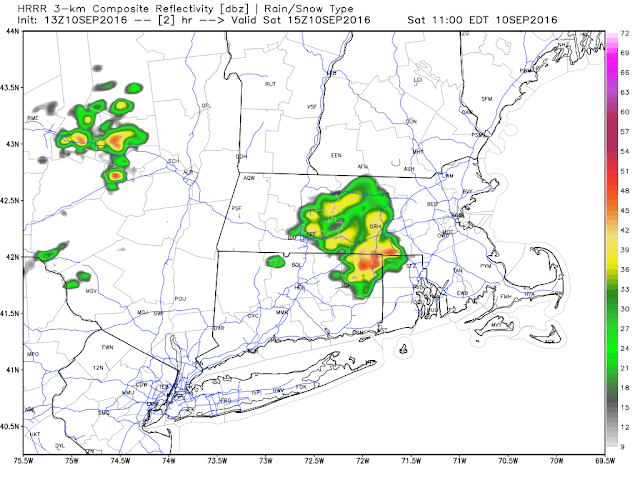 Still a few cells will be possible in MA, NE CT and RI. We need rain and it leads to temperatures like this on Tuesday. Similar weather extends into Saturday. Here is the Saturday AM surface chart. The low pressure and cold front in the Great Lakes will get to New England for Sunday. This may impact all Northeast/Mid Atlantic NFL games on Sunday but given the drought the system could very well trend drier as we approach the weekend. Look for a morning update on facebook on the thunderstorm outlook. Here is the surface map as of 8 AM which shows our warm front. Temperatures from 1-3 will be near 80 in Worcester County and Eastern MA but near 90 in Western MA and CT. 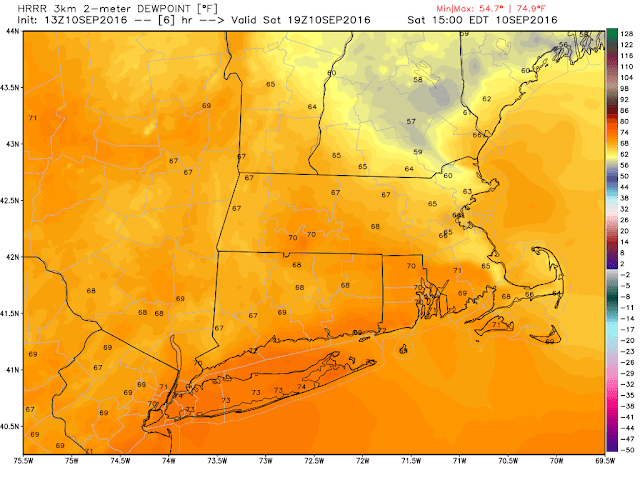 It will be steamy as 3 PM dew points are near 70. 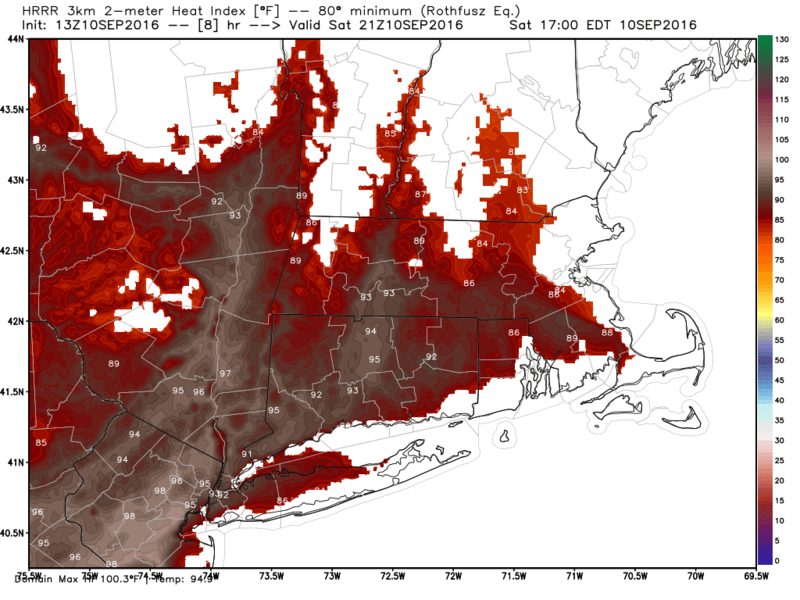 Temperatures will spike in Southern Worcester County by 5 PM into the mid 80's. Heat index at that hour will be in the low 90's. Certainly not a terrible Saturday but the brief rain and humidity will make it uncomfortable at times. A cold front will pass tomorrow AM triggering another round of showers but it will kick out the humidity. Pleasant September weather is on tap for Monday and Tuesday. I'll post tomorrow. Hermine to Strike Florida; What About SNE?